Ironing clothes—the right way—can be harder than you might think. There are many different fabric types and temperature settings, not to mention all the tricky areas like pleats, tucks, seams, and collars. Sometimes just getting out wrinkles can give anyone a headache. But even if you're a novice with an iron, avoiding the most common ironing mistakes will help ensure your clothes come out looking great. Some of these tips begin before you turn on your iron. Clothes are very difficult to iron when they are fully dry or over-dried in the dryer. Over-dried clothes are resistant to reshaping, which it exactly what ironing is. Removing clothes when they are still slightly damp will make ironing much easier. If you line-dry your clothes, bring them inside to iron when they are not quite dry. You can even iron wet or damp clothes that have recently come from the washer. This works particularly well with dress shirts and other garments made with thin fabric. Hang up garments after ironing, so they stay wrinkle-free while they finish drying. It would seem like stuffing as many clothes as can fit into a dryer would save time, but more than likely it will only lengthen the time you spend caring for your clothing. A typical dryer should be only 1/2 full to allow freedom for all of the clothing to move. If you put too much clothing in the dryer, it will come out with monster wrinkles, making your ironing that much more difficult. When clothing is removed from the dryer, it frequently sits in a basket waiting to be ironed. Instead of going straight from the dryer to the basket, take a few minutes and shake out your clothing. Reshape garments, and smooth out seams and pleats. This won't take the place of ironing in most cases, but it will shorten your ironing time and prevent unnecessary wrinkles that may be hard to smooth out. Many irons today come with a built-in sprayer to dampen clothes during ironing. If your iron doesn't have this feature, use a plastic spray bottle filled with water, and dampen the clothing when you're ready to begin ironing. You'll find that wrinkles fall out of the clothing as you iron. If you don't use the sprayer to soften up the clothing, ironing is much more difficult and, for some garments, impossible. Tap water may be okay to use in your iron, especially with today's models, which are more tolerant of hard water than older irons. But if you have very hard water, the minerals in the water can create problems inside your iron. Read the instructions for your iron and, if, in doubt, use only distilled water for all ironing. Starches and sizers are great tools for ironing, but they must be used properly. After you spray the starch or sizer onto the clothing, wait for several seconds to allow it to penetrate into the garment before ironing. 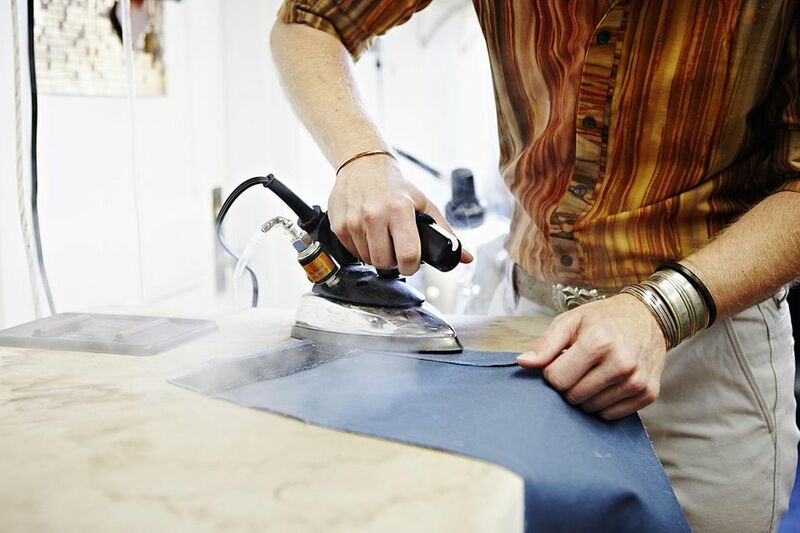 This will help keep your iron's soleplate from getting a buildup of starch or sizing residue. If you have a large pile of ironing to do, start with the coolest fabrics, then work up to the heavier fabrics. Iron delicates, synthetics, and silk at low temperatures. Then, turn up to medium temperature for wool, and finish with cotton and linens on high. Each time you adjust the heat, let the iron come up (or down) to temperature before ironing. Can I Set the Color in Clothes and Stop the Bleeding? Is How You Wash Your Bra Making You Look Older? Why Is My Washer Ruining My Clothes?